Haplogroup N1c is found chiefly in north-eastern Europe, particularly in Finland (61%), Lapland (53%), Estonia (34%), Latvia (38%), Lithuania (42%) and northern Russia (30%), and to a lower extent also in central Russia (15%), Belarus (10%), eastern Ukraine (9%), Sweden (7%), Poland (4%) and Turkey (4%). N1c is also prominent among the Uralic speaking ethnicities of the Volga-Ural region, including the Udmurts (67%), Komi (51%), Mari (50%) and Mordvins (20%), but also among their Turkic neighbours like the Chuvashs (28%), Volga Tatars (21%) and Bashkirs (17%), as well as the Nogais (9%) of southern Russia. N1c represents the western extent of haplogroup N, which is found all over the Far East (China, Korea, Japan), Mongolia and Siberia, especially among Uralic speakers of northern Siberia. Haplogroup N1 reaches a maximum frequency of approximately 95% in the Nenets (40% N1c and 57% N1b) and Nganassans (all N1b), two Uralic tribes of central-northern Siberia, and 90% among the Yakuts (all N1c), a Turkic people who live mainly in the Sakha (Yakutia) Republic in central-eastern Siberia. Note that N1c was known as N3 and N1c1 as N3a in the official phylogeny prior to 2008. 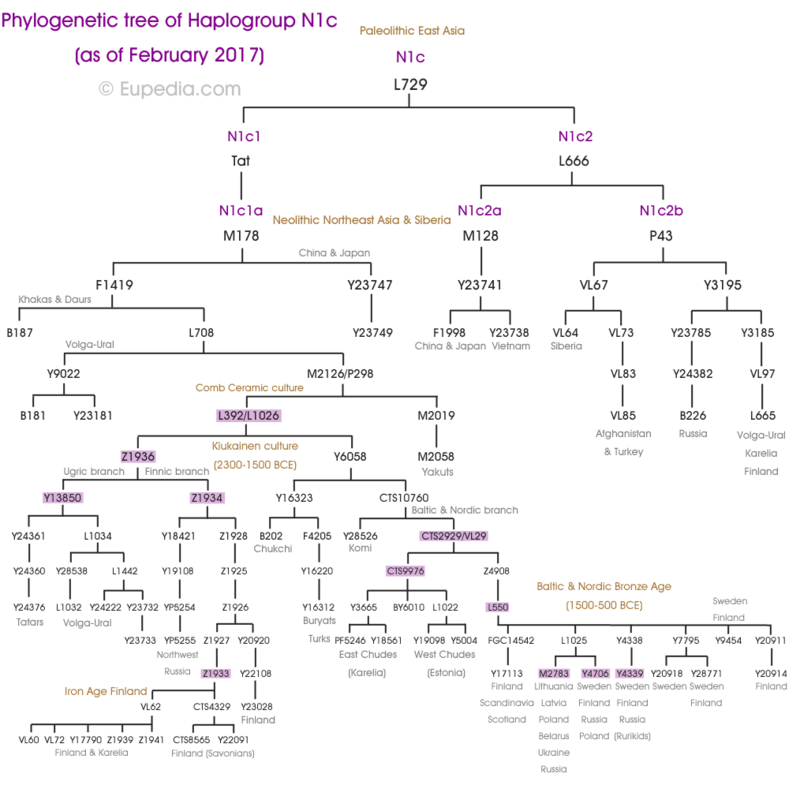 Haplogroup N is a descendant of East Asian macro-haplogroup NO. It is believed to have originated in Indochina or southern China approximately 15,000 to 20,000 years ago. Haplogroup N1* and N1c were both found at high frequency (26 out of 70 samples, or 37%) in Neolithic and Bronze Age remains (4500-700 BCE) from the West Liao River valley in Northeast China (Manchuria) by Yinqiu Cui et al. (2013). Among the Neolithic samples, haplogroup N1 made up two thirds of the samples from the Hongshan culture (4700-2900 BCE) and all the samples from the Xiaoheyan culture (3000-2200 BCE), hinting that N1 people played a major role in the diffusion of the Neolithic lifestyle around Northeast China, and probably also to Mongolia and Siberia. Ye Zhang et al. 2016 found 100% of Y-DNA N out of 17 samples from the Xueshan culture (Jiangjialiang site) dating from 3600–2900 BCE, and among those 41% belonged to N1c1-Tat. It is therefore extremely likely that the N1c1 subclade found in Europe today has its roots in the Chinese Neolithic. It would have progressively spread across Siberia until north-eastern Europe, possibly reaching the Volga-Ural region around 5500 to 4500 BCE with the Kama culture (5300-3300 BCE), and the eastern Baltic with the Comb Ceramic culture (4200-2000 BCE), the presumed ancestral culture of Proto-Finnic and pre-Baltic people. There is little evidence of agriculture or domesticated animals in Siberia during the Neolithic, but pottery was widely used. In that regard it was the opposite development from the Near East, which first developed agriculture then only pottery from circa 5500 BCE, perhaps through contact with East Asians via Siberia or Central Asia. Mazurkevich et al. 2014 confirmed the presence of N1c in the Comb Ceramic culture with a sample from the Late Neolithic site of Serteya II in the Smolensk region of Russia, near the Belarussian border, which dates from the middle of 3rd millenium BCE. The Bronze Age Indo-European Fatyanovo–Balanovo culture (3200-2300 BCE) progressively took over the Baltic region and southern Finland from 2,500 BCE (see History of haplogroup R1a). The merger of the two groups, Indo-European R1a and Proto-Uralic N1c1, gave rise to the hybrid Kiukainen culture (2300-1500 BCE). Modern Baltic people have a roughly equal proportion of haplogroup N1c1 and R1a, resulting from this merger of Proto-Uralic and Northeast Indo-European populations. The phylogeny of N1c1 shows that the split between Balto-Finnic and Uralic (including Ugric) peoples took place around 4400 years ago, downstream of the L1026 mutation, almost exactly at the start of the Kiukainen culture. The Uralic branch (Z1934) formed first, around 4200 years ago, followed by the Ugric branch (Y13850) and eventually the Balto-Finnic branch (VL29) 3600 years ago. The latter immediately split between the Chudes (CTS9976), to the east, and the Balto-Finns (L550) to the west. The Fennoscandians (Y4706) and Balts (M2783) bifurcated around 2600 years ago. Lamnidis et al. 2018 tested six 3500 year-old individuals from the Kola Peninsula in northwest Russia and identified the two male samples as members of N1c-L392. They were all autosomally close to modern Uralic people from the Volga-Ural region and possessed typically Uralic mtDNA lineages (C4b, D4e4, T2d1b1, U4a1, U5a1d, Z1a1a). 2. Immigration from Germany and Poland in the last two millennia. 3. Population exchange with Finland and the Baltic countries when these came under Scandinavian rule, particularly during the eight centuries of political union between Sweden and Finland. Haplogroup N1c1 is strongly associated with Uralic peoples, whis is divided in the following families. The Samoyedic branch on northern Siberia split the earliest and correspond to the N1c1* and N1c1a* subclades. Permic and Volgaic speakers have a wide diversity of N1c subclades, including N1c1a1 (L708), N1c1a1a (L1026), N1c1a1a1 (VL29), N1c1a1a2a (Z1935), and N1c2b (P43). The Baltic Finnic branch appears to have evolved from the migration of the N1c1a1a1 (VL29) subclade from the Volga-Ural region to Karelia, Finland and Estonia. VL29 and its subclades are also the variety of N1c1 found in Balto-Slavic populations, confirming that the R1a branch of Indo-Europeans absorbed and later spread N1c1 lineages around central and eastern Europe. The Ugric branch, which comprises Hungarian, as well as the Khanty and Mansi languages of western Siberia, corresponds to the N1c1a1a2b (L1034) subclade. Did Ural-Altaic languages originate with haplogroup N in the Manchurian Neolithic? 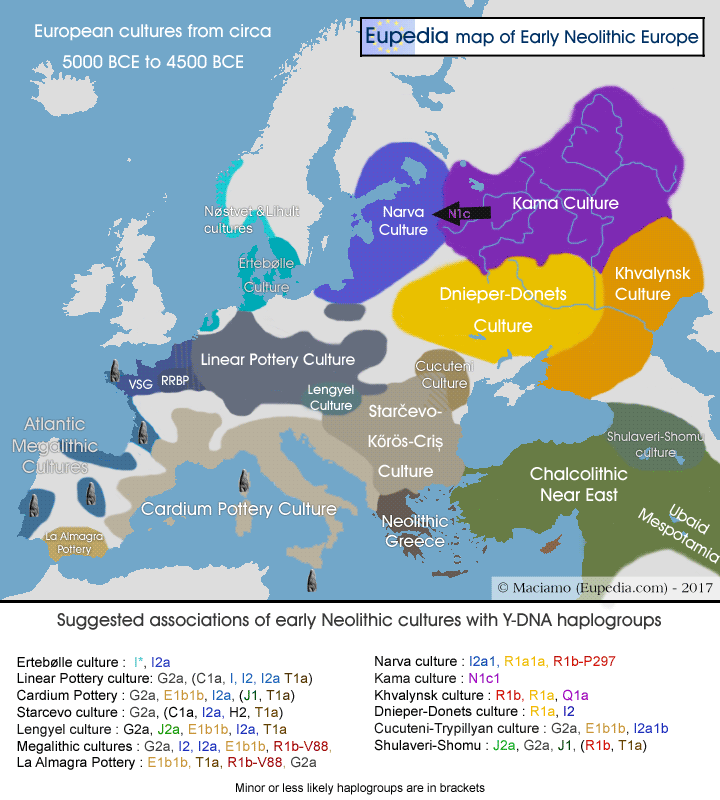 If haplogroup N1c, found mainly among Uralic speakers today, did originated in the Manchurian Neolithic, together with other subclades of haplogroup N, it would explain that Uralic languages are related to Altaic languages like Turkic and Mongolic languages and, more distantly also Korean, Japanese and Ainu, as Y-haplogroup N is indeed the unifying factor between all these populations. Some linguists have argued that Korean, Japanese and Ainu are language isolates, as they only vaguely resemble other Altaic languages. Tellingly, these populations also have the lowest percentages of Y-haplogroup N - only 3% for the Koreans and 2% for the Japanese, as opposed to 10 to 25% for the Mongols and Buryats, and frequencies between 30% and 90% for most Turkic-speaking Siberians. According to the descendant testing listed at the Russian Nobility DNA Project at FTDNA, the branch of the Rurik dynasty descended from Vladimir II Monomakh (Monomakhoviches) belong to Y-DNA haplogroup N1c1-L550 (Y4343 subclade), and includes Alexander Nevsky (1220-1263) and Ivan the Terrible (1530-1584). Notwithstanding, the branch descended from Vladimir II Monomakh's presumed paternal cousin Oleg I of Chernigov (Olgoviches) belonged to R1a1a. The Y-DNA from the Proto-Rurikid branches is N1c1 and matches the distinctive haplotype of the Monomakhoviches. Furthermore, this N1c1 haplotype possess the distinctive value DYS390=23, found in Scandinavia but not in Uralic populations, confirming that this was indeed the original haplotype of the Varangian prince Rurik (c. 830-c. 879) who established the Kievan Rus'. The Rurikid Dynasty DNA Project at FTDNA managed to determine that the Lithuanian Gediminid dynasty, although not descended from the Rurik dynasty, also belongs to haplogroup N1c1. The House of Gediminas ruled as Grand Duke of Lithuania from ca. 1285 to 1440. An offshoot of Geminids is the Jagiellonian dynasty who ruled as the Kings of Poland and Grand Dukes of Lithuania from 1386 to 1572, and also include two Kings of Bohemia, Hungary and Croatia between 1471 and 1526.